Installing the plumbing connections for a washing machine is a fairly straight forward process, that a person of moderate "handiness" should be able to accomplish. 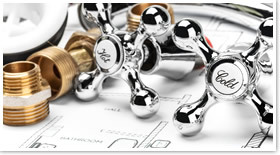 In this article I will describe some basic rules, rough-in information and images to assist you, but if you encounter any problems along the way, just ask for help on the plumbing forum. Clothes washer drains in Canada require a 2" drainage trap and stand pipe, if not draining into a laundry tray. In the US under the IPC(International Plumbing Code), the trap and standpipe must be 2". A standpipe must extend at least 600mm (24") above the trap weir and terminate above the flood level rim of the washing machine(above the top of the washer). A trap receiving the discharge from a clothes washer must be the removable type or have an integrated cleanout plug, as lint and sand are an issue that often clogs Washing Machine drains. There are a few different methods for installing plumbing to a washing machine, depending on whether or not the room is going to be finished. You also have the option of draining the washing machine into a laundry tub or standpipe. If you're planning on having a finished laundry room, than appearance is important; therefore, installing a washer box with all the plumbing hidden inside the wall is the best option. A washer box comes complete with a hot and cold faucet connection, as well as a stand pipe hole for the drain, easily mounting between wall framing members. Some washer boxes will also have water hammer arrestors built-in(see picture) to lessen the effects of water hammer, caused by the fast acting washing machine solenoid valves. A washer box is typically installed at a height of 42" from the floor to the bottom of the box, or as long as that height is above the washing machine's flood level rim. Regardless of whether you are installing a standpipe or a laundry tray to drain the washing machine, you will need to locate and tie into an existing gravity drainage system and vent the trap. Drain height for a laundry tray is 18-1/2" from the floor. The trap should be removable or include an integrated cleanout. The trap must be vented. If you are connecting to an existing stack, you may need to individually vent the washing machine and tie the vent in above the other fixtures draining into the stack. Washing machines requires a 1/2" hot and cold water supply. The water supplies should terminate just higher than the washing machine to allow the hose connections to be seen, and easily shut off when required. Each water supply will require a 1/2" sediment faucet that the washing machine supply hoses will connect to and water hammer arrestors(see example picture).